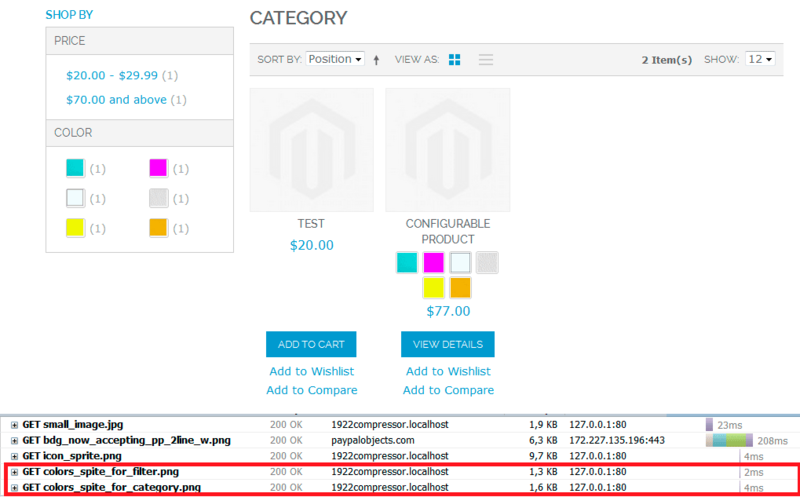 Configurable Swatches module is included into Magento since 1.9.1.0 CE and 1.14.1.0 EE. This module helps users to select product configuration easier. Unfortunately, this module negatively impacts loading speed of category page. Let's see how to combine images into sprites so that to improve page loading speed. What’s wrong with Configurable Swatches module? Configurable Swatches module replace products options with small images (“swatches”) on a product page and in the layered navigation. It also can add swatches to a product listing. Swatches really make your website looking a little bit more pretty. 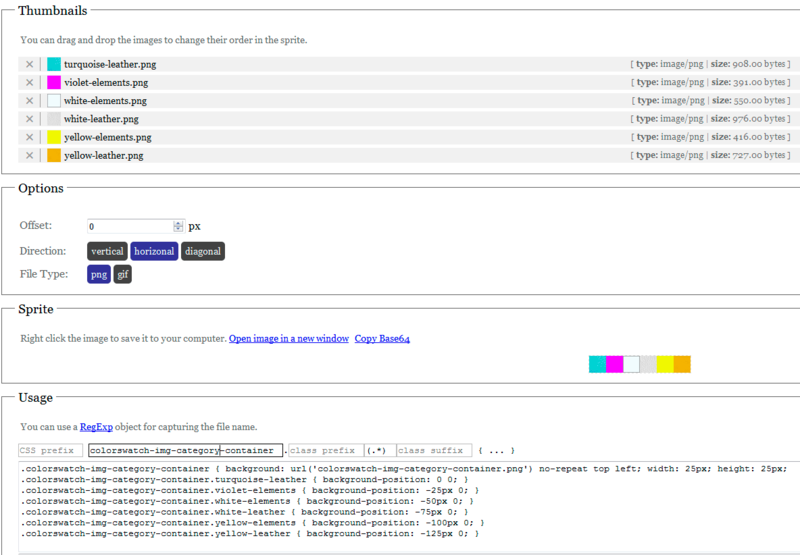 The problem is a browser need to download each of this swatch images. Take a look at the screenshot above. Each of those colorful icons is an image file. Configurable product has 6 product options. 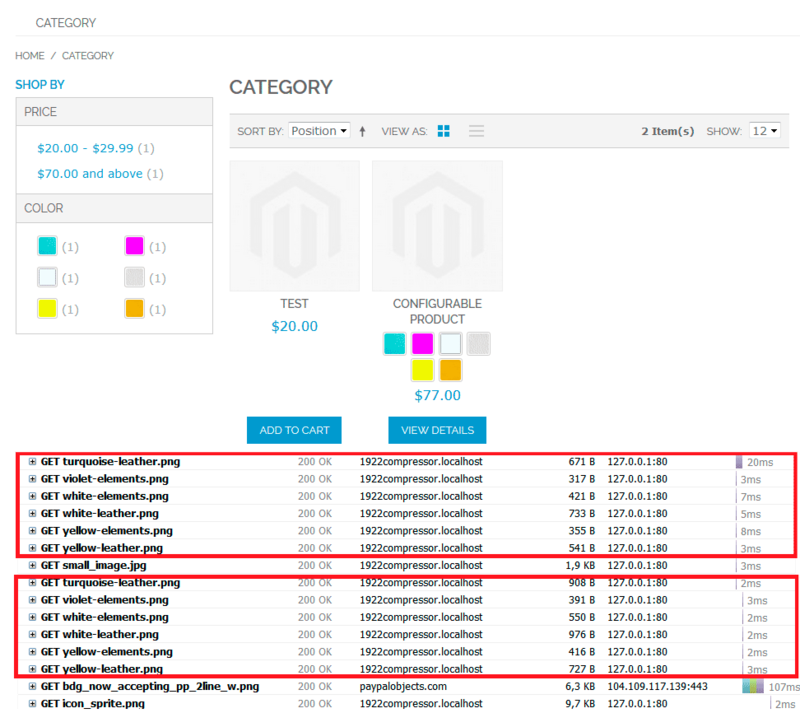 It means that a browser need to establish 12 connections to server (6 images for product options and 6 for filter options at sidebar) in order to download the images. In our case, package is “rwd” and theme is “default”. In our case it is 25x25 for product listing. To create a sprite you can use some service, for example, http://instantsprite.com/. Save the created sprite and optimize the image with some online-service like https://tinypng.com/. This step is needed to reduce sprite file size. Then save styles here generated at Step 3. You also need to set a path to the sprite. In our case it is 21x21 for the filter. Save the created sprite and optimize the image with some online service like https://tinypng.com/. Then save styles here generated at Step 7. Now browser sends 11 requests less. In our case, page total page loading time improved on 10%. This result can be even more impressive if there are dozens of swatches at your website. The only disadvantage of this solution is that you would need to regenerate sprite file each time you update your sprites. 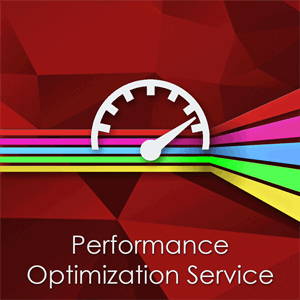 Nevertheless, it is not so difficult to do while website speed is a crucial thing in online business today. Please share this article if you like it.